Are you a parent that loves social justice, equality, peace, and animal welfare? 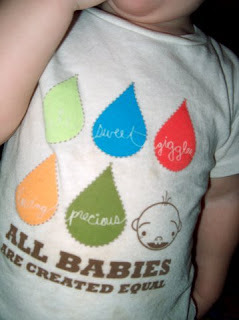 Then you need not look further than Tiny Revolutionary to let your little one make a statement on your behalf! Tiny Revolutionary is on a mission to help raise a generation of fiercely authentic, compassionate, socially responsible children. We do this by designing super cool kid's clothes that speak openly about socially progressive issues like equality, war, the environment and animal welfare. We also celebrate the modern variations of family that continue to inspire our belief that family is not defined by the way it looks, but by the way it feels! 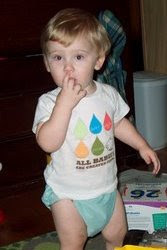 Tiny Revolutionary offers a variety of shirts in several colors and lots of sizes (3 mo-4T) with slogans like "Drive a Hybrid", "I'll Change the World Someday", and "All Babies are Created Equal" (pictured here on your trusty baby model, Noel the Bowl). I loved reading BreeAnne and Courtney's story of their delve into parenthood and starting the Tiny Revolution. They aspire to provide you with clothes that proudly show who your family is and what you stand for-and that's cool! They also donate $1 from every shirt sold to some great charities through their "Tiny Bucks" program. These two put their money where their mouth is by giving back to programs that are important to all of us-Infant Crisis Services and Doctors Without Borders. Head over to Tiny Revolutionary, then get out there and make a difference! To get 15% off of your entire order from Tiny Revolution, enter the coupon code PKB01! Oh, and don't forget, they give any NEW customers a FREE $20.00 gift certificate. Only valid if you are a new subscribers/customer.